View cart “Personal Membership (monthly)” has been added to your cart. Mike teachers CTRI workshops in the areas of violence prevention, restorative justice, and conflict resolution. He holds a Bachelor's degree in Psychology and a Certificate in Conflict Resolution, and has over twenty years of experience as a leader in the conflict resolution and violence prevention field. He believes that learning is a life-long endeavor and that the process of development should be enjoyable and motivating. As a facilitator, Mike uses his experiences working in a manufacturing environment, inner-city drop-in, boys camp, and as a mediator to illustrate the material. He has an interactive and engaging style that easily motivates participants to incorporate workshop material into their own environments. When organizations and communities are not ready to respond to an emergency, the consequences may include people getting hurt, damaged property, or the inability to provide essential services. At its core, the goal of emergency preparedness planning is to help organizations quickly restore the essential services they offer. 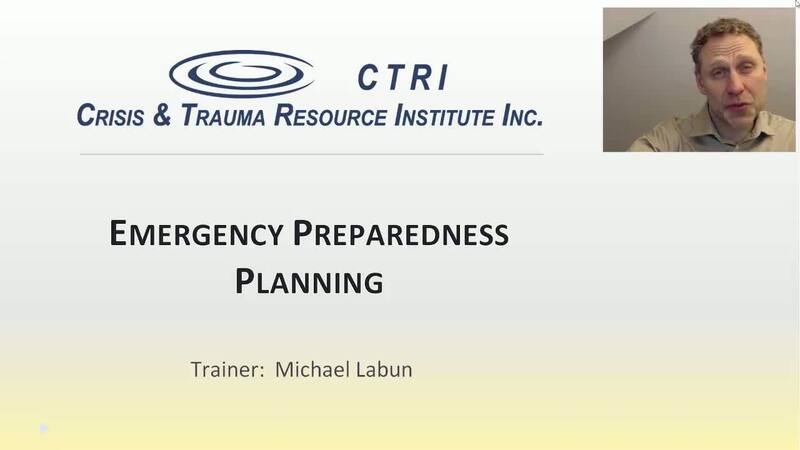 This webinar reviews how to create a proactive emergency response plan that will help minimize human and physical losses, and restore normal operations. A guide for how to organize effectively and quickly at a time of high stress so that groups are better prepared to respond is provided.